Sprinkler Juice: Calling all Ladybugs! Ladybugs, the lady Bug, the lady beetle, or whatever it is you call them are universally respected among gardeners for one purpose: their ability to devour and rid your garden of pests! That’s right; you want to keep your garden free of damaging insects, and ladybugs are on the front lines. If you’re not one for using harsh chemicals on your plants -- and why should you? -- then the ladybug alternative is for you. The following are some ways ladybugs help keep your garden pest free! The Aphid Eater – An adult ladybug can easily consume up to 50 aphids a day -- that’s roughly 5,000 aphids in its lifetime! But aphids aren't the only pests ladybugs feast upon; they will also eat scales, mealy bugs, leaf hoppers, mites, whiteflies, cabbage worms, bollworms, tomato hornworms, and broccoli worms. If you’re a seasoned gardener, you’re probably familiar with most of these pests and would love to ban them from your garden, permanently. Ladybugs can help you accomplish this. Getting them to Stick Around – A common problem gardener’s face when using Ladybugs as pest control is getting these ladies to stick around. If released at the wrong time, you can risk watching your ladybugs simply fly away to relocate on someone else’s property. Here are some ways to get your ladybugs to stick around. Don’t Release during Hibernation – Your ladybug supplier will mostly likely have harvested your ladybugs during their hibernation period. If you release them while they are still in “hibernation mode,” you can bet that they won’t be hungry for yummy aphids. Enjoy the view as your ladybugs fly off in search of a good place to continue hibernating. In order to keep this from happening, you need to understand the hibernation period. Ladybugs hibernate during the fall and winter and wake up when temperatures reach 55 degrees Fahrenheit. Wait until it stays consistently warmer to release the bugs – it’s that simple. Release in the Evening – Ladybugs don’t tend to fly in the evening when it is colder. If you want to minimize the risk of ladybugs leaving your property, then release them in the evening. They will settle down in your garden for the night, and hopefully realize they are now living in a garden full of yummy aphids, whiteflies, and other pesky delights. Release in Small Groups – Do not release the entire fleet of ladybugs at the same time. 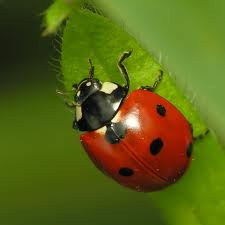 Ladybugs are territorial and will leave the area if it is over populated. Instead, hold some of your little warriors back and let the first wave of bugs settle in. You may not need to release more bugs until the ladybug population begins to drop.